Realising what I had taken on, I soon endeavored to get busy with digging. The first chance I had I took a week’s leave from work and spent three days at the allotment. I was determined to prove the wife wrong – it was no big deal and wouldn’t take long to clear the forest of weeds…. I was, of course, the one in the wrong. After three solid days of digging each weed out with a garden fork, I had cleared 60% of only the larger section of the allotment. This was going to be an insurmountable task far beyond my initial expectations. Reinforcements were necessary and as luck would have it my closest friend announced a visit. I hadn’t the heart to explain quite the extent of the work required, however managed to convince him to agree to ‘a little light weeding’ at my allotment. 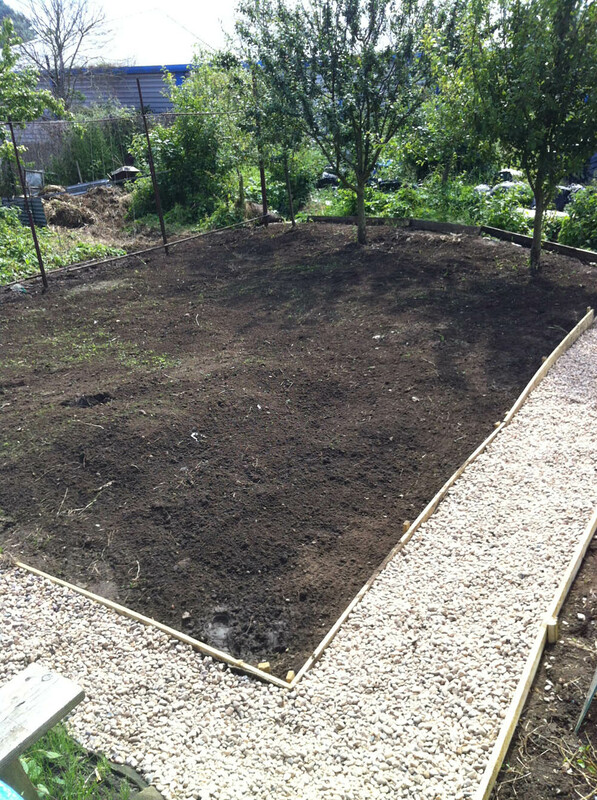 Another two solid days of digging (with two of us) allowed the larger section of the plot to be weed-free. I felt triumphant! Job done! The allotment was ready for next year’s planting. 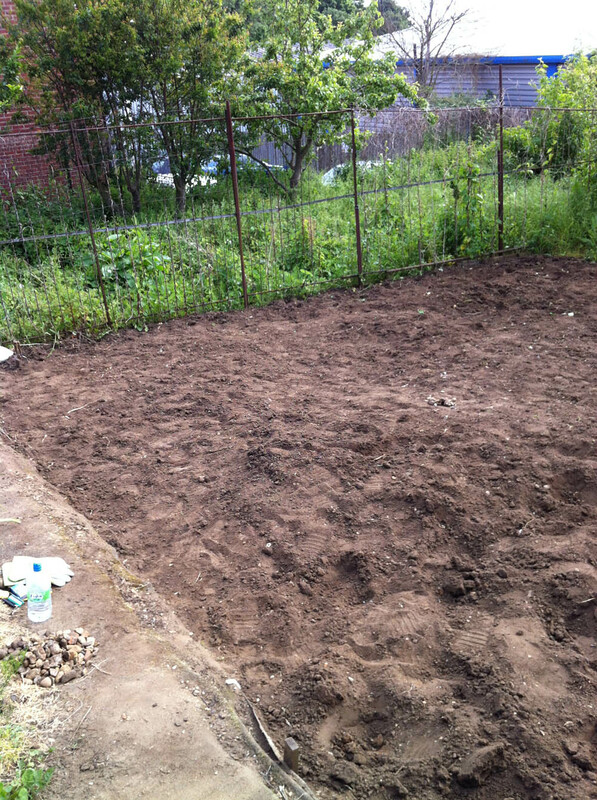 After days of digging out weeds by hand this was the progress. A final day allowed us to build in a pth around the edges to provide a defined space for planting and added a little more structure to the whole affair. This was not without its trials, however, as in the final moments of the task, I managed to stick a Stanley knife info the palm of my hand requiring a little glue and some stitches from the local minor injuries unit. Undeterred, we returned to the allotment to finish off. I put in the paths with a patient and loyal friend! However the weeds were left for longer again (in my naivety I thought it would take a long time for them to grow back). 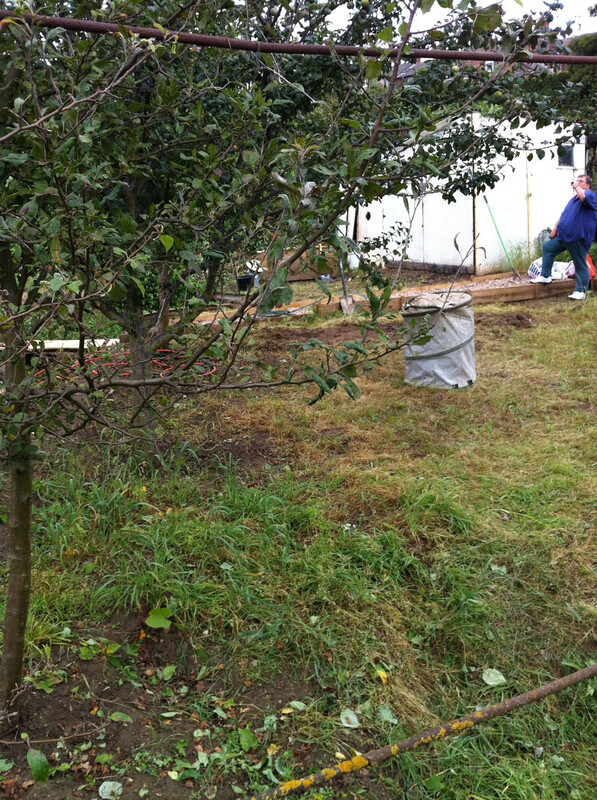 In the autumn of 2012, the allotment was almost entirely covered in grass and weeds again. I should not have left it without working on it. This entry was posted in Uncategorized and tagged allotment, Beginner, bugger, injuries, learning about gardening, making mistakes, naive, oops, overgrown, unimpressed wife, wasted work, weeds, what have I done. Bookmark the permalink.